When you are starting out in learning how to play the piano and how to read sheet music, sometimes it can all seem a bit confusing. How can you transfer your knowledge of what the notes mean on the sheet music to the notes on the piano keyboard? 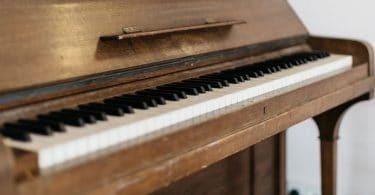 The first step that you should take when you want to learn how to play the piano is to learn the notes on the piano’s keyboard – the names of the black and white keys. There are a few hints, tools and games to memorize the notes of the piano. Memorize.com – This cool little website offers memorization games for a variety of things – including games for memorizing the notes of the piano and games for reading sheet music. It’s a handy tool to use when you are starting out and will offer you games in which you test your own memorization knowledge. You simply click the “memorize” button next to a column such as All Notes (which shows you the position of a note on the piano keyboard and you guess the letter of the note), Treble Staff or Bass Staff (which shows you the position of a note in sheet music on the treble or bass staff and you guess which note it is). The site is free to use. Piano Key Stickers - A variety of these removable piano note key stickers are available on Amazon and can be quite helpful in learning how to recognize the notes on the piano keyboard and in teaching yourself how to play piano (for more about that, see this post). Most stickers are available in sets of 88 keys (or less, if you have a smaller keyboard). The best ones, like these by QMG, show the letter name of the piano key note as well as what it looks like when written in sheet music on the treble or bass staff. As you can see the QMG stickers also include smaller notes at the top to indicate what the next sharp or flat (black key) beside the natural (white) key is called. There are also cute stickers like these from Crosby Audio that work best for younger children who are learning the piano. They include adorable little illustrations for the note letters, to keep kids interested in learning to play piano. Train Your Ears to Recognize Notes – This will come with time as you play the piano more and more often. You will start to recognize the notes you are hearing as you play them and be able to distinguish a C from an E, for example. Some apps and websites can help you to recognize the sound of notes. MusicTheory.net has some free exercises such as Note Identification as well as apps that you must pay for like Tenuto that can help you to identify notes on the piano from their sound as well as their position on the keyboard. Train Your Hands to Play the Right Notes - Finally, you need your hands to work with your eyes and your brain in helping you to play the correct notes on the piano keyboard. This involves practice, practice and more practice! The best tools for learning how to play the right notes on the piano are scales (for an idea of the order in which you should learn piano scales, read this). Learning to play scales on the piano will help your hands learn muscle memory as your eyes and brain correlate what notes you are playing and coordinate that with your hands. Once you have learned the names of the keys on your piano’s keyboard, it’s time to learn how to remember piano notes on sheet music. (For an in-depth look at how to read sheet music for piano, see here). Fortunately, there are many mnemonic devices that have been devised throughout the years to help you in this endeavor. Every Good Boy Deserves Food: this is how you should label the lines on the treble clef staff, from bottom to top, with E, G, B, D and F.
FACE: this is how you should label the spaces between the lines in the treble clef, from descending to ascending, F, A, C, E.
All Cows Eat Grass: this is how you should label the spaces between the lines on the bass clef, from descending to ascending, A, C, E, G.
Good Boys Do Fine Always: this is how you should label the lines on the bass clef staff, from bottom to top, G, B, D, F, A. Software to Teach You How to Read Notes on Piano Sheet Music – You can always purchase software, such as the eMedia Music Theory Tutor Complete, on Amazon that can help you to learn how to read notes on sheet music. This software, which is available for PC or Mac download, will not only teach you how to read notes, but also how to understand rhythms, scales, chords and chord progressions. It’s a handy tool to use when teaching yourself to play piano. Casio LK280 Lighted Key Premium Keyboard Pack- Designed for beginners, the Casio LK280 premium pack includes the keyboard, headphones, keyboard stand and power supply. It is not a full-size keyboard, at just 61 keys, but what it lacks in size it makes up for in teaching ability. The keys on the keyboard light up to guide and respond to the user, and the Casio’s LCD display shows you what’s going on, whether you’re taking one of the built-in piano lessons or changing from one sound to another (600 tones are built into the keyboard). Priced at just over $200, this keyboard pack is a great learning aid for those who are starting to learn to play piano and read sheet music. 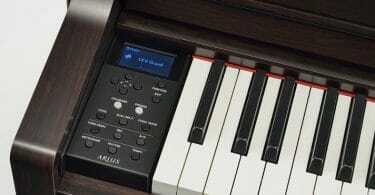 Yamaha EZ-220 Lighted Key Portable Keyboard Package – Another great choice for beginners is the Yamaha EZ-220. It includes the lighted keyboard, headphones, power supply and keyboard stand, and bench seat for just over $250. This 61-key keyboard features lighted keys and wireless connectivity built-in, allowing you to connect to the Page Turner iPad app. Additionally, the keyboard has 100 preset songs built in to help teach you to read notes and sheet music at the same time. If you are interested in learning to play the piano but don’t know the first thing about notes or reading sheet music, fear not. It is possible to teach yourself the notes of the keys on the piano as well as how to read notes in sheet music. With a little time, effort and practice, you’ll soon be playing the piano fluently!